I took part in a beautiful Winter Solstice ritual on the bank of the Thames at the weekend. Yes, I realise the actual date of the longest night and shortest day this year is 22 December, but the group of friends I was celebrating with could only get together a week early. It didn't matter, it was a beautiful, crisp, cold day with frost on the ground in the morning and a clear blue sky overhead. We aimed to meet on the South Bank around lunchtime to try to make the most of the beach that is exposed at low tide, but as is often the way with pagan groups things ran a little late. We had intended to do our ritual in the secluded overhang beneath one of the short piers by the Thames, but by the time we got there, the tide was coming in fast. The question was asked, do we stay here and risk wet feet or find somewhere else? While we all looked at each other waiting for someone to take responsibility for the decision, the Thames herself answered with a wave that sploshed at our feet and got us all hurrying back to a larger stretch of dry beach. And so we did our ritual there, in a beautiful spot with the sand of the foreshore below us, the blue sky above, the Thames flowing before us - and a small crowd of tourists watching from the embankment walkway just behind our heads. Maybe it wasn't ideal - or maybe it was. At the point when the line was spoken: "We welcome the return of the light!" there was, indeed, a flash of illumination. It was, of course, a dozen cameras capturing the moment. Manmade the light might have been, but the timing was perfect. We hadn't intended our ritual to be a public performance, but I do wonder whether the gods had other ideas for us that day. I don't think any of us felt our solstice rite was spoiled by the onlookers - in fact they added to it. And I hope those who were quite possibly watching their very first pagan ritual, felt that their day was enriched. All hail the ancient goddess of rivers Tamesis! And all hail the modern gods of technology! 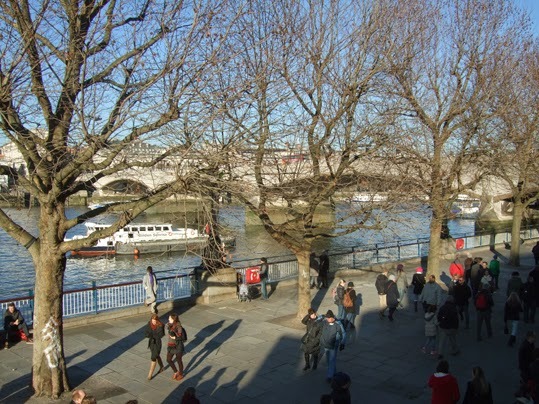 The photo above shows a view over walkway beside the South Bank of the Thames. Sounds beautiful...wish we could see a pic ...as do you Bad, I would imagine? To be honest it doesn't really bother me about seeing pictures - I'm rather used to the notion that cameras aren't normally allowed during rituals. I don't take photos during rituals myself for that reason.